Okie dokie, pics of my last minute valentine's day treats for the fam made by my dd and me. 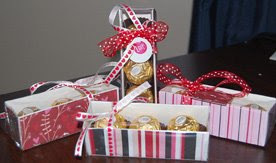 I whipped up some 'no glue required' fold up boxes to perfectly fit 3 Ferrer Roche chocolate treats. We decorated the boxes with scrapbooking papers by heidi grace, wrapped them up with cellophane and finished them with ribbon. By the time we got to making tags and finishing with the ribbon dd got restless (she even went so far as to say 'oh man mum... this is soooo boring" ) So we skipped the cute tags i had lined up and practiced tying shoelaces with the ribbon... kindergarten kids have no style sometimes...lol. So I loved this gift idea so much that i thought i'd share a template with you all. Print it out when you are in need of a quick and easy gift idea - not just for valentines day. They will make good teacher gifts as well. Don't forget to enter our little perpetual calendar competition which ends on the 18th feb. just leave a comment on the calendar post for a chance to score a freebie. 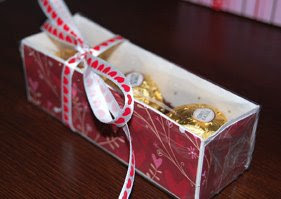 I'm reading: My Handmade Valentines GiftsTweet this! I love this cute box. Thanks for posting the download, can't wait to make one! Thanks for visiting. You have a great blog here too. Thanks for the compliment on my scrappin space on my blog. These boxes are adorable. I put your link on my mini album group, just wnated to share. Beautiful projects you made! You are so talented! And what a great idea of your blog - I loooove minis! Hugs from Poland! Hi, I was wondering, what size paper did u print the template on? a 12 X 12 or something else.